The corn and soybean post-emergence crop protection application season is here. Corn & soybean growers will target post-emergence herbicide applications by the V4 growth stage in soybeans and the four leaf stage in corn to limit yield reductions due to weed competition. 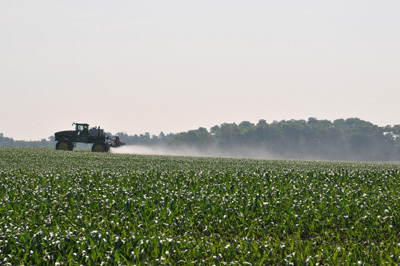 Targeting applications by these crop stages will also help ensure applications are made before weeds exceed three to four inches in height, which is the maximum height on many herbicide labels for most effective control. Always read and follow all product label directions and precautions, appearing on (or included with) the pesticide containers. Some labels have detailed drift minimization requirements for product use. Other labels may only have a broad short statement without details requiring the applicator to prevent drift or not to spray ‘when conditions may result in drift. Small droplets take more time to fall to the ground and can thus drift farther. It is desirable to use a nozzle that produces large, uniform droplets. Switching from standard flat-fan nozzles (such as an XR11003) to turbulence-chamber or venturi nozzles increases droplet size and can greatly reduce the amount of drift. Examples of such nozzles are Turbo TeeJet and AIXR TeeJet nozzles (Spraying Systems Co. http://www.teejet.com/ ), Hypro Ultra Lo-Drift and GuardianAir nozzles (http://www.hypropumps.com/ ), and the TurboDrop nozzles (Greenleaf Technologies http://www.greenleaftech.com/. Handling human pesticide exposure takes priority over handling pesticide drift. . Follow the label for first aid and call the Poison Center at 800/222-1222. For medical emergencies call 911 immediately. Minnesota Department of Agriculture 2015. Pesticide Drift Complaint Process and Timeline. http://www.mda.state.mn.us/en/chemicals/pesticides/complaints/misusecomplaints.aspx (verified 5 June 2015). Minnesota Department of Agriculture, St. Paul.